The Sustany® Foundation celebrates World Sea Turtle Day, which began this week, by embracing the cause of sea turtle protection and preservation in waters worldwide. The conservation of these unique marine reptiles is part of our mission to be responsible stewards of our environment, both land and sea. The foundation knows active awareness and efforts are required to preserve the seven remaining sea turtle species. Sea turtles species include the Leatherback, Green Turtle, Hawksbill, Loggerhead, Olive Ridley, Kemp’s Ridley, and Flatback, all of which the International Union for the Conservation considers either endangered or critically endangered. During the early stages of life, sea turtles suffer from high mortality rates due to both human and environmental causes. Numerous predators such as birds, crabs, dogs, raccoons, and fox hunt for eggs and new hatchlings. Climate shifts, beach erosion, and habitat degeneration are also risks for sea turtles. The greatest detriment to sea turtle survival, however, is human activity. Turtles are frequently captured for their meat, eggs, or shells, and casualties from commercial fishing nets intended for other catches. Chronic pollution from manufacturing and agricultural waste also affects sea turtle populations; in particular, turtles often mistakenly ingest plastic bags perceived as jellyfish. From all of these causes, natural or anthropogenic, in some species as few as one in one thousand eggs survives to maturity. 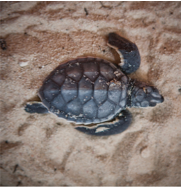 The Sustany® Foundation believes conservation is the key to guarantee a future for sea turtle species and so admires the initiatory efforts of the Inter-American Convention for the Protection and Conservation of Sea Turtles. The Inter-American Convention, or IAC, stands tall as the leader in diplomatic protection of sea turtles in the western hemisphere. Currently containing fifteen countries, the convention frames an intergovernmental legal treaty for the protection and preservation of these species. In a week’s time, the IAC will be holding a Conference of the Parties in the Galapagos Islands of Ecuador. Running from June 26th through the 28th, the conference will debate many issues around the future of the convention and sea turtles. One of these issues will be deciding where to host the Secretariat, the organizing office, of the IAC. This is of special interest to the Sustany® Foundation because Stetson University, through its Institute for Biodiversity Law and Policy, has offered to host the Secretariat on its Gulfport neighborhood campus. Located in our very own Tampa Bay Community, the Sustany® Foundation supports Stetson University in providing an ideal location for the Inter-American Sea Turtle Secretariat and its continuing work to promote a safe, healthy biosphere for this magnificent endangered sea species.